President Donald Trump’s offer Monday to meet with Iranian President Hassan Rouhani caught senior administration officials as well as U.S. allies off guard. Many wondered what Trump could possibly be thinking. Trump’s offer needs to be seen in the context of events in Iran. Iran is in the throes of rapidly growing, country-wide protests which may be the largest it has seen since the 1979 revolution. And worse is yet to come. Beginning next week, U.S. will begin reimposing sanctions suspended by the Obama administration. Iran’s economy, already in a tailspin, stands a good chance of collapsing. Trump made his offer in the context of an overall U.S. policy towards the Iranian regime. That policy was set out explicitly by Secretary of State Mike Pompeo in a speech in May and in another last month. In May, Pompeo told an audience at the Heritage Institute that the U.S. sanctions against Iran would remain in place until the regime abided by twelve U.S. demands. The major demands require Iran to end all of its nuclear activities and come clean about its past nuclear operations; end its sponsorship of terrorism regionally and worldwide; respect the human and civil rights of the Iranian people; and end the aggression it is carrying out against its neighbors both directly and through its terror proxies. In July, Pompeo spoke explicitly in favor of the Iranian people now protesting against the regime. He signaled clearly that the U.S. supports efforts by the Iranian people to overthrow the regime in Tehran. So when Trump offered to meet with Rouhani without preconditions, it did not mean that he does not expect Iran to change its behavior. It meant that he was willing to meet with Rouhani while leading a policy whose goal is the fundamental transformation of Iran (to borrow a phrase from Barack Obama). Trump would be happy if that transformation comes in the framework of a massive change in regime behavior. He would also be happy if it comes through a revolution that overthrows the regime. As for the Iranians, their behavior in recent days probably gave Trump reason to believe they may be desperate enough to at least consider the former option. On Sunday, Iran’s Supreme National Security Council reportedly decided to free the country’s two top political prisoners from house arrest. Hossein Karroubi, the son of Mehdi Karroubi, told the Kalameh website in Iran that the council had decided to free his father and Mir Hossain Mousavi from house arrest. The two have been confined to their homes since 2009, when they led the Green Revolution in the wake of Iran’s 2009 presidential elections. The two men each won far more votes than the incumbent president, Mahmoud Ahmadinejad. But in a mark of the regime’s contempt for the public, and for the very concept of democracy, Ahmadinejad was declared the winner. The mass countrywide protests that followed the stolen election represented the gravest threat the regime faced since the 1979 revolution. To save itself, the regime sent its Basij paramilitary forces into the crowds of hundreds of thousands of protesters that gathered throughout the country demanding its overthrow. The Basij forces brutally repressed the protesters. Mousavi, his wife, and Karroubi were confined to their homes. Then President Obama, who was keen to reach an accord with the regime, refused to back the protesters. The regime’s decision to free its top political prisoners is not a sign that it is willing to admit its crimes or make amends to the Iranian public. It is a sign of desperation. With each passing day, the size of the crowds in the streets protesting against the regime, and the number of cities in Iran that are experiencing major protests, grows. The slogans they shout are not limited to demands that the regime bear down on corrupt officials and lower inflation. Protesters are calling for the overthrow of the regime. Reza Shah was the founder of the dynasty that was overturned in the 1979 Islamic revolution. It is also the name of the Shah’s son in exile. As for Mousavi and Karroubi’s announced release, although the movement they led in the wake of the 2009 presidential election morphed into an attempted revolution that was brutally suppressed, Mousavi and Karroubi are not revolutionaries themselves. They are reformists deeply embedded in the regime. In the 1980s, Moussavi served as prime minister and foreign minister, and Karroubi served as speaker of the parliament. Khamenei and his advisors no doubt view the two men as a bridge to the protesters in the streets, who can moderate their demands and so stabilize the regime. But the fact that the protesters are now insisting there is no distinction between reformers like Mousavi and Karroubi and hardliners like Iranian Revolutionary Guards Corps Al Quds Force commander Qassem Suleimani indicates that the regime may be a day late and a dollar short. It isn’t just that the protesters want revolution and not reform. They also want America. They hate the regime more than they hate the United States. Under the circumstances, attempts by regime officials to blame Iran’s economic problems on the U.S. are doomed. After failing to convince the Europeans to bypass U.S. sanctions, the only way the regime can save even a semblance of a normal economy is to beat a path to Washington. And so, over the past week, Suleimani and Foreign Minister Javad Zarif beat a path to Muscat, Oman, in the hopes of working something out. Muscat served as a mediator between the Tehran regime and the Obama administration in the early stages of their contacts, so it was a natural place for the Iranians to turn to renew contacts with Washington today. Immediately after his meetings with Zarif and Suleimani, Oman’s Foreign Minister Yusuf bin Alawi bin Abdullah flew to Washington for meetings with Secretary of State Mike Pompeo and Secretary of Defense James Mattis. The Iranians deny that they are using Oman as a mediator. But the confluence of meetings makes it difficult to accept their claims. It is all the more difficult to take their position seriously when Trump made his offer to meet with Rouhani during bin Abdullah’s visit to Washington. This, then brings us to the purpose of Trump’s offer, and what it tells us about Trump’s view of how to achieve the American goal of fundamentally transforming the regime — either by coercing it to abide by Pompeo’s twelve conditions or by supporting a popular revolution. Only time will tell if Zarif’s and Suleimani’s attempts to open channels of communication with Washington signalled regime willingness to consider such a transformation. The fact that Pompeo repeated the U.S. position on CNBC after Trump made his offer for talks suggests that the administration thus far has not been lured by the regime into changing its policy. Although the media portrayed Pompeo’s statement as contradicting Trump’s assertion that there are no preconditions for negotiations, Pompeo simply restated the administration’s position when he told CNBC that the Iranians need to accept the basic parameters of the U.S. position set out in his speech at the Heritage Institute as a basis for negotiations. One of the things that distinguishes Trump from Obama, as well as from George W. Bush and Bill Clinton, is how he views negotiations. When his predecessors sought diplomatic channels with Iran and North Korea, they willingly discarded all the other levers of statecraft, including military and economic pressure. The Bush administration took North Korea off the State Department list of state sponsors of terrorism and withdrew economic sanctions on Pyongyang. Clinton provided North Korea with fuel and food. The Bush administration downplayed Iran’s role in fomenting and maintaining the insurgency against U.S. forces in Iran and Afghanistan, and Iran’s role in the September 11 attacks. And Obama gave Iran an open road to regional hegemony in the Middle East through a host of economic, military, and political concessions at the expense of U.S. allies and interests throughout the Middle East. Trump, in contrast, uses diplomacy in tandem with economic and military pressure to foment a change in behavior in his opponents. As Breitbart News’ Joel Pollak explained, the difference between Trump’s offer to negotiate with the Iranians and Obama’s offer to negotiate with them is that Trump’s offer was made from a position of strength while Obama’s offer was made from a position of weakness. If Trump senses that the Iranians are willing to make a deal along the lines set out by Pompeo — that is, if the regime is willing to agree to curtail its sponsorship of terror and mayhem and end its nuclear program without war — he would be a fool not to pursue it. Assuming he handles them properly, if the talks fail, the Iranian public will be more than willing to blame the regime. That said, there are two major risks to holding negotiations. First, the Iranian people may view such negotiations as a signal that the U.S. will sell them out. To mitigate that risk, it is imperative that any talks be conducted publicly. The regime will use secret channels as a means to signal that like the Obama administration, the Trump White House supports it against the Iranian public. The second risk is not unique to discussions with Iran, but is a risk in all negotiations between Western democracies and authoritarian tyrannies. All negotiations have a tendency to create a dynamic in which reaching a deal – any deal – becomes more important than achieving the goals that brought the parties to the negotiating table in the first place. Western leaders, who are subject to media scrutiny and election pressures, are more susceptible to the pressure to achieve a deal than leaders of dictatorial regimes like those in Iran and North Korea. As a consequence, the dynamic of negotiations works against the interests of the Western powers and favors the interests of the authoritarians they face at the table. In the current context of U.S.-Iranian relations, we will know that we should be concerned about this dynamic if and when the administration diminishes its public support for the anti-regime protesters in Iran. On Wednesday, U.S. Central Command warned that Iran is about to launch a massive military exercise in the Straits of Hormuz. Suleimani and other regime leaders have threatened repeatedly in recent weeks to seal the maritime choke point through which 20 percent of world oil shipments transit if the U.S. blocks Iranian oil exports. This Iranian move, like the missiles its Houthi proxies shot at two Saudi oil tankers in the Bab el Mandab choke point in the Red Sea least week, shows that the Iranians also know how to talk and shoot at the same time. Obviously, it is too early to know where Trump’s offer will lead. But what is clear enough is that Trump’s offer to negotiate with Iran is no fluke. It is a shrewd, albeit high-risk move made in a complex and highly dynamic and dangerous standoff between the U.S. and its allies — and a lethal, menacing regime whose back is up against the wall. Perhaps equally important is the escalation in the overall tone of protesters’ messages, respective to the 2009 demonstrations. While the earlier movement was primarily focused on the disputed reelection of President Mahmoud Ahmadinejad, current slogans include calls for “death to the dictator,” in reference to Supreme Leader Khamenei and, by extension, the entire system of clerical rule. It is reasonable to conclude that the suppression of previous demonstrations combined with the regime’s inability or unwillingness to address the underlying grievances is leading a growing number of Iranians to the conclusion that regime change is a necessary prerequisite for the improvement of their own future prospects. INU – International coverage of Iran’s nationwide protests continued on Tuesday and began to display common narratives as the demonstrations entered their sixth day. 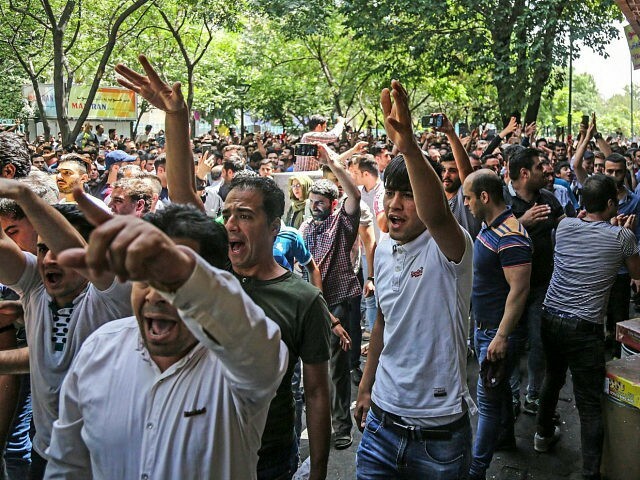 The initial protests in the city of Mashhad, allegedly organized around economic issues by conservative opponents of President Hassan Rouhani, led to unexpected expansion in both the geographic and ideological scope of subsequent gatherings. This in turn led to highly predictable government crackdowns, resulting in numerous arrests and several deaths. CNBC was among the outlets to report that nine people had been killed in the midst of the demonstrations on Monday night. One hundred people were reportedly arrested that night in the capital city of Tehran alone, after 250 others had been arrested in the same locality over the previous two nights. Figures for the total numbers of deceased and arrested protesters appeared more inconsistent as of Tuesday. It was generally agreed that the nine deaths from the previous night had raised the total to more than 20. Al Jazeera placed the figure at 22 and also reported that at least 530 people had been arrested. But the National Council of Resistance of Iran, drawing upon its intelligence network inside the Islamic Republic, specified higher figures in both instances, saying that at least 30 people had been killed and 663 arrested. The NCRI also provided a breakdown on the location of a number of these arrests, in addition to the 450 that took place in Tehran. That breakdown demonstrates one key fact that has been widely observed about the current wave of protests: they are different from the 2009 Green Movement and generally unusual among Iranian protest movements insofar as they are not geographically diffuse, involving a number of rural areas that are considered to be conservative strongholds rather than being focused primarily on socially progressive urban areas like Tehran. In fact, Iranian officials appear to have responded to the growing protests in part by insisting that their original economic focus remained the only significant driving force and that the demonstrations held limited appeal in the capital and in other major cities apart from Mashhad. Following the first day of protests, it was reported that Tehran officials had declared that only 50 people attended a local gathering and that most of them dispersed immediately following police warnings. Similar messaging seemed evident in quotations cited in the Los Angeles Times, with officials asserting that despite 450 arrests in three days, the demonstrations in the capital were naturally dying down. Those remarks went on to speculate that the rest of the country would soon follow suit. The nearly simultaneous claims about mass arrests and waning popularity are not the only instances of self-contradiction in the regime’s response to the protests, Al Jazeera raised this issue in the context of Supreme Leader Ali Khamenei’s personal response to the situation, which emerged for the first time on Tuesday. Khamenei sought to portray the protests as primarily the work of outside agitators. Business Insider quoted him as specifically blaming “wicked enemies backed by westerners, easterners, as well as reactionaries of the region”. In the first place, his decision to weigh in is at odds with other officials’ attempts to downplay the significance of what is happening. At the same time, Al Jazeera notes that by giving credit to foreign infiltrators for such widespread demonstrations, Khamenei is contradicting the regime’s official position that such infiltrators have little real influence in the Islamic Republic. In fact, Al Jazeera asserts that the latter position is correct and that Khamenei’s claims regarding a foreign hand in the protests are not at all credible. This, of course, is not to say that there hasn’t been an outpouring of foreign interest as the demonstrations have stretched on. Neither does this observation lead to the conclusion that foreign support for a domestically-driven movement hasn’t been welcomed by Iranian activists. Indeed, aBBC report consisting of direct commentary from Iranian citizens includes one quotation embracing the supportive remarks delivered by Israeli Prime Minister Benjamin Netanyahu via Instagram. Apart from offering personal support for the protesters’ cause, Trump has also overseen responses from the White House that are passing through more official channels. ABC News reported on Tuesday that the administration was keeping up pressure to prevent Iran from blocking the social media platforms that have been used as effective organizing tools for the ongoing demonstrations. The Associated Press added that the White House was actively encouraging Iranian citizens to use virtual private networks in order to evade some of the new blockages that the Iranian government is imposing on specific websites. Much of the international press has criticized President Trump over his direct commentary on the protests, suggesting that any American effort to influence their trajectory would feed into the Iranian supreme leader’s efforts to discredit the demonstrations as the work of foreign agents. Nevertheless, many of the same outlets have expressed earnest support for what the Trump administration is doing at the policy level, as opposed to at the level of pure public relations. The Atlantic, for instance, insisted that any active American interference would help hardliners, but then advocated for Western powers the help facilitate the free flow of communication within Iranian society. Also, in an interview with PBS NewsHour, Karim Sadjadpour of the Carnegie Endowment for International Peace recommended that the US could help to inhibit Iran’s ability to control communication, adding that one way of doing this would be by censuring any information technology companies that provide Iranian leaders with the tools to limit access within their country. Sadjadpour also highlighted the considerable impact that the continued flow of information could have on the future of the still-emerging movement, which has reportedly been spreading in absence of centralized leadership or specific, across-the-board demands. He pointed out that whereas Twitter had been a highly successful organizing force in the 2009 Green Movement protests, those protests took place at a time when only one million Iranians could access the platform via smartphones. Today, 48 million Iranians have such devices. The continued use of those devices as organizational tools would no doubt contribute to a situation that the BBC described as an “unpredictable challenge” for the ruling regime. The BBC also observed on Tuesday that momentum was still building for the grassroots movement. According to theIndependent, that momentum is such that protesters in some areas have actually overpowered security forces and members of the basij civilian militia, disarming and dispersing some of the forces that might otherwise have violently repressed the gatherings. This fact, combined with the lack of any notable defections near the top of the regime, leads the Washington Post to conclude that the current demonstrations are unlikely to lead directly to a political tipping point. But the same report suggests that the suppression of those demonstrations will lead to the later recurrence of the same. Other outlets agree with this assessment, and Reuters cited the likelihood of repression leading to further protests as one of the main points of interest for Western leaders who are watching the situation unfold. Would Iranians really bring back the Shah? [T]here once was another Iran, one where women had freedoms; living standards were rising; human rights were improving (he learned that the Shah’s much vilified SAVAK secret police, for instance, committed far fewer crimes than Soviet-linked propagandists had claimed); and the country was integrated with, not isolated from the world community. The Shah, Cooper argued, really did want to see his country advance in the world, and he enacted many democratic reforms. Is it really that far-fetched that the [deceased] Shah[‘s son, Reza Pahlavi] might be seen as a legitimate alternative for Iran? Not with these current things going on. Right now, U.S. policymakers should be ignoring the Stanford establishmentarian elites on Iran and reading Cooper’s book as fast as they can. He appears to have no ulterior motive other than doing what he can to help his countrymen in Iran and his willingness to become the necessary catalyst to dislodge the current brutal regime. Reza Pahlavi wants the Iranian people to rise up against the regime and establish a parliamentary democracy based on democratic values, freedom, and human rights. Pundits have marveled at what a big surprise it is that ordinary Iranians have revolted against the mullahs. It’s a surprise to them, but no surprise to American Thinker’s readers, whose Iranian contributors have kept us posted for years about what is really going on in Iran. Just look at these pieces by Hamid Bahrami, Reza Shafiee, Hassan Mahmoudi, Amil Imani, and Shahriar Kia. Over and over again, these writers warned there is a problem, and now Iranians’ protests against corruption, soaring prices, environmental ruin, Revolutionary Guards thuggery, poverty, and bank collapses have become the “surprise” story of the day. One writer at Politico correctly noted that the “surprise” stems from reporters covering only Tehran’s elites, not the doings in the hinterlands. The hinterlands, of course, are where the trouble started, beginning in Mashhad, and these are the parts of the country American Thinker’s writers have been bringing us information on. These writers showed long ago that what we are seeing now isn’t your garden-variety protests of city elites seeking “reform” or “fair elections.” These protests are smaller, but they’re the real kind, revolutionary ones, actual calls for the overthrow of the regime and the initiation of a new government. Protests now aren’t coming from the comfortable elites who just want a little bit of tweaking. On the surface, it sounds ridiculous that anyone would want to bring back a king, even as a constitutional monarch in a democracy. But it’s real. Here is an account by Voice of America about the rise of the late Shah’s son, Reza Pahlavi, a smart, photogenic, democracy-oriented leader, waiting in the wings as an alternative to the corrupt, sneering mullahs. Reza Pahlavi is the son of the late Shah of Iran. I have never had the honor of meeting or speaking with him, although I judge any man based on what he says and what he does. As I watched this man grow and become a seasoned politician, my admiration for him grew stronger. In my opinion, Mr. Pahlavi has become the very asset that the opposition has needed for many years. American Thinker’s writers, most recently Hassan Mahmoudi, have noted that in the shouted slogans in the crowds, many were calling for the return of the Shah. Russian propaganda organ Sputnik has noted the phenomenon in the streets, too. It’s worth noting that kings are easily understood by average people and for that reason have appeal, especially in light of the failure of the current regime. I have one story of my own that suggests that a return to the Shah may not be as far-fetched as it seems. An old friend, Andrew Scott Cooper, spent years of research to write a fascinating scholarly book about the last days of the shah of Iran, titled The Fall of Heaven, published by Henry Holt & Co. last year. He actually managed to reach and interview the former shabanu, or, queen, of Iran, Farah Diba, who was living in exile in Europe. From that, he wrote a fascinating, unique account of the Shah’s last days, largely told through her eyes. It was a sympathetic analytic history, intended, as he told an audience at the Nixon Library last year, to show that there once was another Iran, one where women had freedoms; living standards were rising; human rights were improving (he learned that the Shah’s much vilified SAVAK secret police, for instance, committed far fewer crimes than Soviet-linked propagandists had claimed); and the country was integrated with, not isolated from the world community. The Shah, Cooper argued, really did want to see his country advance in the world, and he enacted many democratic reforms. Naturally, saying something out of the ordinary, or contradicting the conventional wisdom, is a good way to get panned, and so publication of the book was followed by several critical book reviews – in the top papers, often by Iranian-Americans affiliated with the elite establishment centers of Iran research, such as Stanford. These were scholars who had an interest in maintaining the conventional wisdom and who may have had interests getting contracts from the mullahs. These are the same people whom policymakers and newspaper editors tend to consult as experts and were the people who said all was well; just stay out of Iranian affairs and let them handle it. In addition, there was a creepy campaign on Amazon to drive down the ratings of the book by similar people who had never even read it – and Amazon put a stop to it. What this all showed is that there existed a large entrenched establishment with an interest in maintaining the status quo, and its operators were aghast at the idea – now being shouted in the streets of Iran – that maybe bringing back the Shah could be good. Of course, they hated this louche idea. But this came against another subplot of the publishing of this book, which was that a hell of a lot of those books, thousands of them (showing Iranians their own history and teaching them that Iran was once a very different place), somehow got smuggled into Iran, and the locals lapped them up. As a result of this, within a few days, a full Farsi translation of the book will be coming out, which should stoke conversation about this in Iran even further, given the interest shown. Publishers don’t publish books in non-Western languages if they don’t think they will sell. Obviously, the publishers knew that something big is going on and published the costly translation. Iranians, starved of information about their own history, are likely to lap this up just as they lapped up the English-language version. Given what is going on in Iran now, call it fat on the fire. Here is Andrew Cooper signing copies of his book – which sold out with a line waiting. Is it really that far-fetched that the Shah might be seen as a legitimate alternative for Iran? Not with these current things going on. Right now, U.S. policymakers should be ignoring the Stanford establishmentarian elites on Iran and reading Cooper’s book as fast as they can. Confronted with those 2009 demonstrations that did not go as far or demand as much, Barack Obama betrayed the demonstrators to every grisly fate that the mullahs could devise for them in their torture chambers. Bent on concluding the disastrous nuclear deal that lined their oppressors’ pockets with billions and set the world on a path to a catastrophic nuclear attack, Obama ensured that the U.S. government didn’t lift a finger or offer a word of support for the protesters, even as they were being gunned down in the streets. What has changed? Donald Trump. Reza Shah was the Shah of Iran from 1925 to 1941 and the father of Mohammed Reza Pahlavi, the Shah who was overthrown in the Islamic Revolution in 1979. Reza Shah admired Turkey’s Kemal Ataturk and set Iran on a similar path of Westernization and secularization. In chanting this, the protesters are emphasizing that they do not just want economic reforms, as has been the line of the establishment media in the West. Nor do they want an Islamic Republic that is less corrupt. They don’t want an Islamic Republic at all. So should terrorists decide where our embassy should be? Trump was not willing to concede this point. And when one man shows that bullies can be confronted and stood down by people with courage, others are inspired to make the same kind of stand. This new Iranian uprising came just weeks after Trump’s Jerusalem announcement, after the threatened rage and riots of Muslims worldwide in response to that announcement proved to be largely a fizzle. Is it a coincidence that the Iranian people have stood up to the forces of jihad intimidation just after the President did so? Maybe. But if so, it’s a marvelous one, and in either case it’s illustrative of the power of courage in an age of cowardice. For here again, even if the Iranian freedom movement has nothing to do with Trump, it is certain that these demonstrations would already be over, and may never have begun, if Hillary Clinton were President of the United States right now. Confronted with those 2009 demonstrations that did not go as far or demand as much, Barack Obama betrayed the demonstrators to every grisly fate that the mullahs could devise for them in their torture chambers. Bent on concluding the disastrous nuclear deal that lined their oppressors’ pockets with billions and set the world on a path to a catastrophic nuclear attack, Obama ensured that the U.S. government didn’t lift a finger or offer a word of support for the protesters, even as they were being gunned down in the streets. For the people of Iran, with help from Donald Trump, this could just possibly be the dawning of a new era of freedom. Even if the regime remains in power this time, it has been shaken to its core. It cannot afford to be as openly repressive and bloodthirsty as the Chinese at Tienanmen Square. Not, we can hope, with Donald Trump in the White House. Protesters, risking their lives, have been chanting, “Death to Khamenei” — a serious crime according to the clergy, and punishable, according to the Sharia law of the regime, with death. People are also chanting, “Death to Rouhani”, “Shame on you Khamenei, step down from power”, “Death to the Dictator” and “Death to the Islamic Republic”. Protesters are tearing down the banners of Iran’s Supreme leaders, Khomeini and Khamenei. Now, people in Iran are demanding not just limited reforms but regime change. The government has been doing all it can to stoke the flames of hatred, but has been trying to deflect it to “Death to America” and “Death to Israel”. The Trump administration is taking the right side by supporting the Iranian people; they are the principal victims of the Iranian regime and its Islamist agenda. Let us not be on the side of history that would remain silent in the face of such crimes against humanity, let us not join the ranks of other dictators, terrorists, and criminals, that turned a blind eye to violence, and the will of brave, innocent people. Protests have grown and have spread across Iran in cities such as Tehran, Kermanshah, Shiraz, Rasht, Qom, Hamedan, Ahvaz, Isfahan, Zahedan, Qazvin, and Sari. The political nature of the protests has been made clear from the outset and the regime is experiencing a political earthquake. The regime’s gunmen have been out in full force. Despite the brutal power being deployed to crush these peaceful demonstrators — four protestors have already been reported killed — more people are flooding the streets in defiance of the regime. The scale of these sudden protests is unprecedented during the last four decades of the Islamic Republic of Iran’s rule. These demonstrations, however, are different from other protests in Iran since 1979, when the theocratic regime was established. In 2009, during the popular uprising in the name of the “Green Movement,” people were protesting against rigged elections and the presidency of the anti-Semitic politician Mahmoud Ahmadinejad. Chants echoed through the streets, “Where is my vote?” while the government ratcheted up its power to silence the protestors. Now, people are demanding not just limited reforms but regime change. After almost four decades of living under a theocracy — with Islamist mullahs controlling them, rampant corruption, and the regime’s persistent dissemination of propaganda — the people have reached the boiling point. The government has been doing all it can to stoke the flames of hatred, but has been trying to deflect it to “Death to America” and “Death to Israel”. Chants being heard all over the nation are, “Forget about Palestine, forget about Gaza, think about us”, “Death to Hezbollah”, “The people live like beggars / [Khamenei] lives like a God,” and “Leave Syria alone, think about us instead”. The outcry leaves no question about the needs of the people, and the real voice of Iran. Demonstrators are making a clear distinction between the Iranian people’s desired policies and those being carried out by the regime. All political and economic indications are that protests in Iran will continue to grow. The Trump administration in the United States is taking the right side by supporting the Iranian people; they are the principal victims of the Iranian regime and its Islamist agenda. Let us be clear. The fault lines are completely visible. If you are on the side of justice, freedom, and basic human rights, and if you respect humanity, you will not be able to remain silent. Let us at least give moral support, if not more, to the Iranian people. Justice and truth need to prevail. This is what history has repeatedly shown us. Let us not be on the side of history that would remain silent in the face of such crimes against humanity, let us not join the ranks of other dictators, terrorists, and criminals, that turned a blind eye to violence, and the will of brave, innocent people. Dr. Majid Rafizadeh, is a business strategist and advisor, Harvard-educated scholar, political scientist, board member of Harvard International Review, and president of the International American Council on the Middle East. He is the author of “Peaceful Reformation in Iran’s Islam“. So let’s all root for the Iranians who are, once again, trying to overthrow their reactionary Islamic regime. A victory against the mullahs in Iran would have beneficial results for everybody except devout Shi’ite Muslims and their allies of convenience on the American, largely atheist and most certainly anti-Christian, Left. By removing the source of Hezbollah’s support, pressure would be relieved on Israel and on American forces still in the dar-al-Harb theaters of war. By demolishing rule-by-mullah, Iran would pose much less of a nuclear threat to civilized nations. And by freeing the Iranian people to choose a new government, the Western democracies could find a valuable new ally in a strategically important part of the world. For millennia, the people of Iran have been unable to decide where to cast their lot. In its attempts to move westward, the Zoroastrian Persian Empire was defeated repeatedly by the Greeks, by Alexander the Great, and by the Byzantines; later, Persia was conquered by the Muslim Arabs, by the Mongols (who really put paid to the “Golden Age”) and by Tamerlane, among others. If Iran can successfully overthrow the Islamic Republic, de-institutionalize Islam, rediscover its own genuine nationalism, and elect a real republic in its place, this historically pluralistic nation will likely find a warm welcome. Islam has brought nothing but misery to Iran. Perhaps it’s time for Iran to try something different. The end is near for the mullahs of Iran, which is bad news for the Islamic Republic of Iran, but good news for the Persian people, who have a chance to free themselves of the baleful effects of the Arab conquest and — finally — join the community of Western nations by casting off its imposed Islamic theocracy and, it is to be hoped, Islam itself. The late Shah of Iran attempted, in part, to de-Islamicize historic Persia of its foreign influences via the restoration of the Peacock Throne, but his revolution was overturned, in part via the Soviet-inspired meddling of the Iranian Tudeh Party, which left the gates open for the ayatollah Khomeini. Both the Russians and the Americans lost when Khomeini came to power, and Iran shortly thereafter seized the hostages at the U.S. Embassy, precipitating (among other events, including the disastrous American economy) the fall of the Carter administration and the election of Ronald Reagan. Ever since, Islamic Iran has been unremittingly hostile to the United States, as well as to its schismatic co-religionists elsewhere in the Muslim-conquest world, especially Sunni Iraq and, of course, Saudi Arabia. It is fashionable today to cite the Islamic “golden age” – a direct result of its contact with Christian Europe, we should keep in mind – as a model, not just for what Islam could one day again become (unlikely, since militant Islam explicitly wishes to return to its seventh-century purity), but also as an apologia for Islam’s many and violent sins against the international order. But until Islam casts off Saudi-fueled Wahhabism and Irian Shi’a millenarianism, gives up its supremacist designs, and becomes willing to accommodate peaceful co-existence contact with West – beyond its oil-driven importation of Mercedes-Benz and Maserati automobiles and Western firearms – this is unlikely. Show me just what Muhammad brought that was new and there you will find things only evil and inhuman, such as his command to spread by the sword the faith he preached. The events unfolding in Iran right now are therefore a long time coming, and ought to be welcomed not only by those fearful of the “Islamic bomb” that Iran is hell-bent on possessing and which the Obama administration’s disgraceful, faciliatory “deal” made all but inevitable, but by all adherents of the Western notion of freedom. During the last serious protests in Iran, the “green revolution” of 2009, Obama reacted supinely, standing idly by as the youthful demonstrators were shot in the streets of Tehran and the “clerics” restored iron-fist rule. For another, the Iranian exiles who fled their country in the late Seventies and early Eighties (taking a great deal of wealth with them) for the U.S. and elsewhere has given birth to a new generation of secularized Iranians, who are in no mood to trade in the liberties of the West for the repressively “theology” of militant Shi’ite Islam. Having seen what happened to their parents and grandparents, they are unlikely to feel a sudden surge of Islamic patriotism; in fact, it has been the prospect of losing these people for the ummah that lies behind so much of the Islamic propaganda that has been allowed to flourish, shamefully, in the U.S. and elsewhere in the West since 9/11. Donald Trump is certainly the opposite of an anti-American president, and he has no affection for our enemies. He has enabled the Ukrainians to fight, perhaps effectively, against the Russians. So why can’t he enable the Iranians to fight against the ayatollahs? In the Ukrainian case we’re talking about military weapons; in the Iranian conflict the weapons are political. If the Iranians rose up against the regime when Obama entered the White House, you can be sure they are at least equally motivated to do it with Trump in office. There are many protests in Iran today, and the Khamenei/Rouhani regime has responded by executing half as many Iranians as in the past. We should relentlessly expose this mass murder, and we should publicize the ongoing protests. The target audience for such exposes is the great mass of the population. Paradoxically, Iranians are better informed about events in Jerusalem and Washington than in Iranian Kurdistan, the southern oil regions, and cities like Mashad and Qom. [T]he protest against foreign intervention has taken on a life of its own, with activists chanting such slogans as “forget about Syria; focus on us” and “no Gaza, no Lebanon; I will give my life only for Iran.” Despite the prevalence of these sorts of messages in social media and public accounts of the demonstrations, Iranian officials continue to maintain that the regional military prestige of the Islamic Republic remains broadly popular. For instance, the Huffington Post quotes hardline cleric Ahmad Alamolhoda as claiming that only about 50 protestors had expressed regional concerns within a gathering of several hundred. Deutsche Welle quotes one Iranian lawmaker as blaming these problems on “illegal financial institutions” that had been established under the administration of former President Mahmoud Ahmadinejad. The closure of one such bank, called Mizan, reportedly had a particularly marked impact on Iran’s second most populous city, Mashhad, which has been the focal point of protests that spanned much of central and northern Iran as of Thursday. The lawmaker’s account of the protests seemingly absolves the current government of responsibility for the conditions that are being protested by victims of a widening income gap in the Islamic Republic. But the DW article also points out that a major target of those protests has been current President Hassan Rouhani’s slow progress in following through on a promise to reimburse citizens whose investments were wiped out by the collapse of state-linked financial institutions. At the same time, DW and various other outlets have highlighted a trend toward broader focus in those protests, targeting not just rising prices and not just financial indicators as a whole but also the Rouhani administration’s failure to uphold a wide variety of promises regarding domestic reform. Insofar as the abandonment of these promises represents closure of the political gap between Rouhani’s political allies and those of hardline authorities like Supreme Leader Ali Khamenei, the protests seemingly double as an expression of opposition to the clerical system as a whole. Indeed, the BBC refers to the demonstrations as “anti-government” protests in its reporting on Friday, as well as identifying them as the most serious and widespread such gatherings since the 2009 Green Movement, which emerged out of protests against Ahmadinejad’s disputed reelection. Those protests lasted for eight months and ended with a severe crackdown by government authorities, but many Iran watchers have observed that the resentments voiced by that movement continued to simmer under the surface in anticipation of another mass demonstration. This is not to say that there have been no major protests in the ensuing year. Indeed, the National Council of Resistance of Iran has identified thousands in the past year alone. But these have tended to be more geographically confined than the current demonstrations, and many have been focused not on politics but on specific demands such as the payment of overdue wages. The content of Thursday’s and Friday’s protests was evidently broad enough in scope that even some Iranian officials were compelled to acknowledge the “anti-government” nature of chants and slogans, even while downplaying the scope of their appeal. The Associated Press reports that the governor of Tehran, Mohsen Hamedani, had acknowledged the spread of the protests to the Iranian capital, yet insisted that the gathering involved fewer than 50 people, most of whom dispersed after being warned by police. Hamedani added that those who remained were “temporarily” arrested, and these remarks seemed also to downplay the severity of the government’s response to what might be regarded as a serious threat to its legitimacy. However, social media posts from various cities depicted peaceful protests being met with tear gas and water cannons, and the crowds in each of those gatherings numbered in the hundreds or in the thousands. By the end of Thursday, there had been at least 52 arrests in Mashhad alone, according to the BBC. Political imprisonment is rampant in the Islamic Republic, and the BBC report also indicates that this was one of the topics that had been advanced by some protestors. But political focus of any given participant in the demonstrations might be different from those of any other, as evidenced by media reports identifying chants as targeting economic issues, political imprisonment, Iran’s paramilitary interventions in the surrounding region, and so on. This latter topic is closely related to the economic issues that reportedly sparked the protests, since the Iranian government has spent billions of dollars in recent years on propping up the Syrian dictatorship of Bashar al-Assad, as well as on promoting the growth of the Houthi rebellion in Yemen and the various Shiite militias operating in Iraq. A recent editorial in Forbes points out that the new Iranian national budget, introduced by Rouhani in early December, includes the provision of 76 billion dollars to the Iranian Revolutionary Guard Corps and its foreign special operations Quds Force, at a time when tens of thousands of victims of a November earthquake are still awaiting basic shelter and government services. But the protest against foreign intervention has taken on a life of its own, with activists chanting such slogans as “forget about Syria; focus on us” and “no Gaza, no Lebanon; I will give my life only for Iran.” Despite the prevalence of these sorts of messages in social media and public accounts of the demonstrations, Iranian officials continue to maintain that the regional military prestige of the Islamic Republic remains broadly popular. For instance, the Huffington Post quotes hardline cleric Ahmad Alamolhoda as claiming that only about 50 protestors had expressed regional concerns within a gathering of several hundred. Since that initial reaction, Iranian officials seem to have increasingly justified crackdowns through acceptance of the broader characterizations of the protests’ grievances and goals. Norouzian himself came to describe the protests as having been organized by “counter-revolutionaries”, according to DW. According to other sources, officials have also referred to the organizers as “hypocrites,” a term often applies to members of the leading Iranian opposition group the People’s Mojahedin Organization of Iran. But even if the initial economic focus of the latest protests had been voiced in isolation, there is an argument to be made that this also would constitute an expression of opposition to the continued rule of the clerical regime. In fact, this argument was made by historian Ellen Ward on Friday in an editorial published by Forbes. Ward observes that despite some officials’ efforts to blame the previous presidential administration for ongoing problems, it is really the underlying clerical system that is responsible for the economic future of the Iranian people. This is to say that it is the clerical authorities, and not the elected branches of government, who establish and enforce policies with tremendous economic impact, including the interventionist foreign policy. Ward’s argument is reminiscent of the statement put out on Thursday by the PMOI’s parent coalition the National Council of Resistance of Iran. That statement quoted NCRI President Maryam Rajavi as saying that the economic prospects of the Iranian people cannot be expected to improve until the resistance movement has brought about the emergence of democratic governance in place of the theocratic dictatorship.